Lay the poster-board on the ground. Choose a place where little artists will have plenty of room to move around. Pour paint into the containers you have chosen. Encourage your little artist to paint with their feet by walking across the poster-board, dragging their feet over the paper, blending colors with toes, and stamping their footprint. Keep an extra container of water nearby. As soon as your little artist is finished painting, let them soak their feet in the bucket of water to help wash off paint. I’ve found this project works best if each child paints with only one color at a time, and feet are rinsed in-between color changes. Stepping into buckets of many different colors of paint consecutively will eventually muddy all the colors resulting in brown, murky paintings. 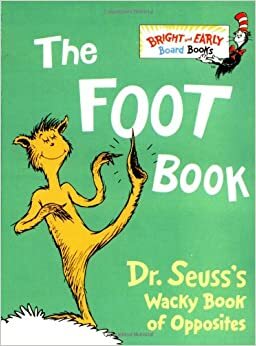 Before or after your painting with feet project, read the book The Foot Book by Dr. Seuss together with your little artist.